No one could have imagined that a small boy, who was a school dropout, would one day rule the Bollywood music scene. It reads like a fairy tale. A poor boy, called Pheeko, was a barber’s son. He, along with his five older brothers, lived in Kotla Sultan Singh village, near Amritsar. He had no interest in studies. In a significant decision, the District Consumer Disputes Redressal Forum here recently held the railway authorities responsible for the loss of a suitcase of a passenger. The decision was taken following the complaint of Mr Baldev Sachdeva, a resident of M.M. Malvia Road. As many as 12-members, including teachers from Croydon, London of Department of Educational and Skills, UK, under the aegis of Commonwealth Council recently interacted with the students and faculty of Sri Ram Ashram School. The Khalsa College Public School is organising free evening classes for its students to help them secure good marks in the exams starting next month. The students stay on the school premises till late evening to prepare themselves for the exams. Phulbagh Kaur, an archer from the local BBK DAV College for Women, has been making waves in the country for her performance at national level. She secured second position in the All India Inter-University Championship that concluded at Nagarjuna University Campus, Vijaywada (Andhra Pradesh), on January 24. She garnered 294 points out of 360. She also bagged first position in trail among all boys and girls. SHARPSHOOTER: Phulbagh Kaur during one of her practice sessions. Plays have its own place in Punjab’s literary culture and a stage artist lives thousands of lives during a single life span. In the last few decades, Punjabi stage has flourished and proved its excellence amongst other theatre traditions with the unending and selfless contribution of various artists who were instrumental in taking to Punjabi stage to other parts of the world. Among all genres of literary works, children’s literature demands utmost responsibility and painstaking efforts from its writer as it helps in shaping the formative years of a tender mind. The septuagenarian, Mr Avtar Singh Deepak, has dedicated his life to the literature for children. The comprehension of Sikh grammatical tradition was a must, in order to perceive the message of Guru Granth Sahib. The Fifth Guru, Sri Guru Arjan Dev, had very strong understanding of the grammatical structure of Indian languages, which was reflected in the editing of this holy scripture. The Chairman of the Life Insurance Corporation, Mr A K Shukla, has said that the insurance company was planning to enter the Gulf countries for setting up overseas business centres to solicit petro dollars. “Moderate politics has replaced the political extremism in the present era. Hence, the political extremism has been relegated to periphery and moderate politics has started dominating the political scenario of the state”. Dr Vanita Arora, consultant, Interventional Cardiologist and Cardiac Arrhythmia Services in the Department of Cardiology at the Escorts Heart Institute and Research Centre, has emerged as the first woman cardiologist to implant Implantable Cardioverter Defibrillator along with Bio-ventricular pacemaker, a combo device, saving lives of many patients suffering from coronary heart disease. Accusing the police of not taking action to check the rising theft cases, the sarpanch of Rorawala Kalan village falling under the Gharinda police station has written to the Deputy Commissioner and other senior police officials to seek action against the robbers. Ms Laxmi Kanta Chawla, state Vice-president of BJP, has urged the government and the General Manager, Northern Railways, to start an express train for Amritsar-Haridwar-Dehradun route. She said the railway authorities had decided to add new AC three-tier coaches with the current passenger train. There was a fakir who went around the village every day begging for alms in the name of Allah. In his melodious voice, he chanted, “Khedan de din char ni maen…” Young Pheeko began to imitate him. 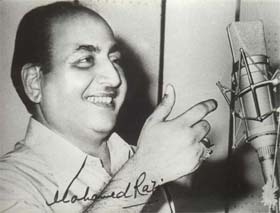 This was the beginning of the career of the great singer Mohammad Rafi, who won the hearts of millions with his songs. His father apprenticed him at his uncle’s hair-cutting salon in Lahore that was the famous film centre in pre-Partition days. Rafi’s elder brother, Hamid Rafi, then decided to concentrate his efforts on providing all support needed by his brother to make it big in the music world. Rafi learnt Hindustani Classical music under the guidance of renowned Ustaad Bade Ghulam Ali Khan and Vahida Khan at a very young age. Rafi sang thousands of super-hit songs. He started his career in the film industry at the age of 20, with a Punjabi song, “Soniye Hiriye, teri yaad ne bahut sataya” for the movie “Gul Baloch”, which was released on February 28, 1944. He became the most sought-after playback singer around 1948. When Mahatma Gandhi was assassinated, Rafi sang a song “Suno suno ay duniya walon, Bapu ki yeh amar kahani” written by Rajinder Krishan. The music for this was given by Hunslal Bhagatram and it was a great hit. The kutcha house of Rafi was demolished by a farmer to construct his own dwelling. The one-room memorial raised by a memorial society of the village has virtually been converted into a shed for cattle. The village receives a regular traffic of Rafi devotees, especially from across the border. Some pay their respects at the spot where Rafi’s house was located. Others consecrate that spot by taking some soil from there with them. However, they receive a rude shock on learning that the old house does not exist anymore. Kotla Sultan Singh village is at a distance of about 25 km from Amritsar and falls in Majitha police district. Nothing on the way shows that Mohammad Rafi was from here. Only on the outskirts of the village there is a signboard saying “Mohammad Rafi Marg”. This signboard, too, was put up with great efforts. As one walks down the village and inquires about Rafi’s ancestral house, one comes across blank faces. However, Anita Devgan and her actor husband Hardip Gill, who belongs to the village, have taken the initiative to organise the first ‘mela’ (festival) in the memory of Mohammad Rafi in the village itself. Anita is also preparing a documentary on the life of Rafi. Shockingly, this tree has also been cut. His close friend, Luddan (now Mr Kundan Singh Samra), who studied with him till Class IV in the local primary school, says the memories are still fresh in his mind. “How can I forget the days we spent together? I still remember he used to sing so well even when he was very young.” He claims that Rafi’s house was adjoining their house and the two families shared very good relations. However, as Rafi’s family was not financially sound, the father of Rafi started some business in Lahore and later took his entire family along with him. The Rafi family visited the village only once after leaving this place. It was when Mohammad Rafi got married to his cousin Bashira (n), nick named ‘Majhi’, in 1945 here in the village. Mr Samra said he had met Rafi again in 1954 when the latter had come to Attari. “He took a few of us in his car to watch his programme and throughout the night kept announcing that he belonged to Kotla Sultan Singh village. In 1956, Rafi came to Amritsar for a concert. Some of the villagers went there and met him before the show began. He met them with warmth. Whenever someone from our village went to Mumbai, Rafi would help them in whatever way he could,” he added. Rafi’s friends, recalling their childhood days, said they would return to their respective homes late in the evening. Deen Mohammad, the paternal uncle of Pheeko, would thrash him for ‘roaming about’. 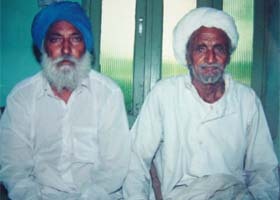 His other childhood friend, Mr Gurbaksh Singh Gill (82), said that Pheeko, thanks to his “carefree nature”, would wander around in the lanes of the village. Before Partition, Lahore was the major film centre, where as early as the 1920s, silent movies were made. D.M. 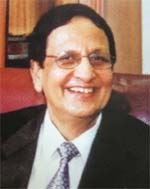 Pancholi was instrumental in the development of Lahore’s film industry. Pancholi’s studio was managed by Diwan Sardari Lal, when he left for Mumbai (then Bombay) in the late 1940s. The first Pakistani film, “Teri Yaad”, made by Mr Lal, was released in 1948. It did not succeed at the box office, but Lahore retained its importance. Rafi’s songs are just as popular today as they were during his life time. His voice was so versatile that it suited any mood ranging from the happy to the gloomy. His voice continues to haunt music lovers even today. Although he worked with different music directors, the one who recognised and exploited his immense talent was Naushad. His first song for Naushad was “Hindustan ke hum hain, Hindustan hai hamara” in the film “Pehle aap”. The duo worked together to give hits such as “Baiju Bawra” and “Mere Mehboob”, to name a few. Rafi’s other fruitful partnership was with SD Burman, and some of their famous hits are “Kagaz ke phool”, “Guide”, “Tere ghar ke samne” and “Pyaasa”. Rafi sang some of the best songs for heroes under the influence of alcohol like “Din dhal jaaye” in “Guide” (1965) and “Choo lenedo nazuk hothon ko” in “Kajal” (1965), without touching the alcohol himself! His love for Punjab and his contribution to Punjabi films is unforgettable. Rafi brought cheers and smiles to millions of his fans through his songs. In his songs like “Main zindagi ka saath nibhata chala gaya”, he tried to inspire the dejected and give hope to those who had lost faith in life and God. On July 31, 1980, a massive heart attack silenced this peerless singer forever. But his divine voice will never fade from this earth. Every year, the Rafi Memorial Society, founded by late photo journalist Jaspal Singh Rana, a great Rafi admirer, holds a concert in Amritsar in Rafi’s memory. Reports have filtered in about the “unhygienic” food being served in trains, especially in those travelling long distance. She alleged that since the contractors had been assigned the job to supply food in trains, the quality of food had deteriorated considerably. “Despite having kitchen and warming facilities in trains, the contractors are being given the contract for the supply,” she alleged. Even in expensive travels like Shatabdi, the quality of food had gone down, she alleged. “The passengers are being forced to eat the food because they have paid for it,” she further alleged. In a way, this amounted to fleecing, as many passengers had to carry their own food, as they did not want to consume the food that was provided in trains, Ms Chawla alleged. Besides, she objected to the fact that there was no separate arrangement for keeping vegetarian and non-vegetarian food. “Many vegetarians complain that both types of food are served simultaneously from same trays. Many of the vegetarians object to such arrangements and on being ignored, they prefer to skip these meals in trains, despite having paid for it,” she alleged. Highlighting a different problem being faced by the train passengers, a senior resident of the city has filed an affidavit and complained to the railway authorities regarding the “rude” behaviour of a railway TTE of Howrah Express. Taking objection to the TTE’s “unbecoming” behaviour, the passenger has urged the authorities to conduct surprise checks to keep a tab on railways employees and take strict action against them in case they resorted to “rude” behaviour with passengers. In a significant decision, the District Consumer Disputes Redressal Forum here recently held the railway authorities responsible for the loss of a suitcase of a passenger. The decision was taken following the complaint of Mr Baldev Sachdeva, a resident of M.M. Malvia Road. Mr Sachdeva, in his complaint, alleged that the theft had occurred on March 9, 2004, while he was traveling in Swarn Shatabdi from Amritsar to Delhi. The complainant had alleged that his suitcase had been stolen because of the negligence and deficiency in service on the part of the railways in not checking the unauthorised persons entering in the reserved compartment. The forum stated that the theft of the suitcase of the complainant in an Executive Class after he had boarded a train clearly constitutes an act of negligence on the part of the railways and also a deficiency in service as it failed to protect the luggage of its passenger who had paid for travelling. The complainant, on his part, had immediately lodged the complaint with the appropriate authority and had supplied the list of articles contained in his suitcase. On the basis of the list, he had to incur a loss of Rs 10,000. However, after examining the list of articles the court decided that the complainant had to suffer at least a loss of Rs 5,000 as all the articles were of wear and tear nature. Therefore, the court directed the railway authorities to pay Rs 6,000, including the cost of the litigation to the complainant. The group was here to study indigenous and other varied methods of teaching, besides drawing comparisons and contrasts between the education being imparted in the public and the government-run rural schools. The group included Mr Hodley Shaw (coordinator), Ms Zarina, Ms Alastair, Ms Pamela and Ms Carol. In a significant development, the UK group agreed for a students exchange programme with the local school, wherein the students could have first hand experience of life in India and correspondingly in the UK. During interaction, delegates Ms Senga Gaffey and Ms Teresa threw light on the education system in the UK and highlighted its flexibility in its endeavor to develop confidence among students. It also emerged that “no child was failed” in projects and all were given equal opportunity. Interestingly, all students at the age of 7, 11, 14 and 16 have to clear a common examination ‘SATS” conducted by the government. “The students with special needs are promoted to the next level and special trainers are appointed to assist them and help improve their grades. A cultural programme, which was presided over by the school’s trust president Dr Harbilas Rai, was also held in the school. A colourful Rajasthani dance and Ganpati ‘Stuti’ (prayer offering) was presented during the programme that enthralled the delegates who also joined in the dance and enjoyed Indian food. Thrilled over the traditional welcome by Principal Ms Preeti Sharad, along with members of staff, to adding to the perception of rich Indian culture ‘tilak’ and ‘aarti’ the members refused to part with their marigold garlands. Later, the school gifted souvenirs of school magazines and other items, to the delegates, who also reciprocated presenting books, stationery, CDs on the UK education system to the school students and the staff. The Khalsa College Public School is organising free evening classes for its students to help them secure good marks in the exams starting next month. The students stay on the school premises till late evening to prepare themselves for the exams. The evening classes are benefitting the students, especially those who come from far-flung villages. Gurbir Singh, who comes from Padhari Kalan in Sur Singh village, said some of the students came from remote border areas, where there was no arrangement for electricity during power cuts in the villages. “At home, students usually face disturbances, which affect their studies,” he added. Therefore, he said it was very convenient to study in a calm and peaceful atmosphere of the school. “We burn midnight oil to get good marks and the school principal and staff were taking serious interests by holding late evening classes,” he said. Ms Harinder Riar, the school’s Principal, said that it was a very useful experience. She said the students had aptitude and potential in them, but the only thing was to make them channelised. The idea of late evening classes was proving beneficial and fruitful, Ms Riar said. The teachers also help the students by motivating and inspiring them, she added. The principal said in this effort, the cooperation of the parents, students, staff and family members was very helpful. Behind the innocent looks and charming smile of Hargun Kaur lies a storehouse of tremendous talent that is hard to match by another nine-year-old. This was evident when Hargun won a silver trophy for her “foot-tapping” performance in the All-India Finals of “Surtarang National Singing Talent Hunt” in the sub-junior category (non-filmi) held at Talkatora Stadium in New Delhi recently. While noted singer Penaaz Masani anchored the show, Ismail Darbar presented the award. The finals were also telecast by Delhi Doordarshan on February 14. As Hargun sang “Dama Dum Mast Kalandhar” for the finals, during presentation of awards Ismail commented “Ali da pehla number and Hargun da doosra number” to a rapturous applaud by the audience. Hargun, like her name, is multi-faceted. 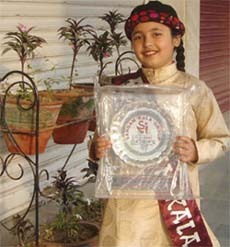 She also won the national award for “Best Harmonium Player” last year held in Jalandhar. At a mere three years of age, Hargun was able to follow the jingles that her father Tejinder Singh, a businessman, playfully played for her on Harmonium, while her mother looked on amusingly as the father-daughter duo graduated to singing duets together. “Family evenings were singing extravaganzas and the silence in the house only prevailed when Hargun was either sour or unwell”, says the proud mother, Ms Ravinder Kaur. Also brilliant in academics in DAV School, Hargun was granted double promotion from class third to class fifth. “My teacher Narinder Srivastava prepared me for the final,” says Hargun, who has also been offered to sing live by ‘Watan Radio’, telecast in Canada in its programme ‘Eh mera Punjab’ by its producer Harjeet Singh Gill. From 245 candidates narrowed down, Hargun was selected amongst top six to emerge second in the singing talent hunt contest. An ardent admirer of Lata Mangeshkar, the young singer is adept at singing classical, light, folk, Shabad, bhajans and ghazals, besides western. She also shows her skill in rendering ‘Ved Mantra’ chanting. Other than state level awards, Hargun has distinguished herself in performing at Gurdwaras and mandirs, including “Guru Ka Mahal”, “Khadoor Sahib”, “Durgiana Mandir” and “Devi Talab Mandir”, Jalandhar . With many district and state awards under her belt, Hargun was granted special award by ‘Godrej Punjab Idol’ by DD-I as she was adjudged underage, similar was the case during the ‘Harballabh Sangeet Sammelan’ which on finding her underage gifted her a special prize. Phulbagh Kaur, an archer from the local BBK DAV College for Women, has been making waves in the country for her performance at national level. She secured second position in the All India Inter-University Championship that concluded at Nagarjuna University Campus, Vijaywada (Andhra Pradesh), on January 24. She garnered 294 points out of 360. She also bagged first position in trail among all boys and girls. On the basis of this impressive performance, she was subsequently selected for the Open Senior National to be held at Jamshedpur from February 22. Earlier, she secured first position in the inter-college tournament held in January this year. Phulbagh’s sports career began when she was studying in Class X in Government Girls School, Fazilka. She credits her success to her coaches Renuka, Himmat Chauhan, Satinder Kaur and Balraj Virk. This national player and a student of B.A. Part II aimed at making a mark at international arena. She says that her goal is to represent the country at international sports and earn medals for it. She remained state champion in archery for three consecutive years beginning from 2001. However, her career got a major boost in 2003 when she clinched the silver in the School National in 2003. The next year, she joined college and secured silver medal in her maiden appearance in the inter-college and gold medal to her team in the All Indian Inter-varsity Championship. Phulbagh Kaur says that to compete at international tournaments it is almost inevitable to prepare oneself on scientific lines and use sophisticated equipments. 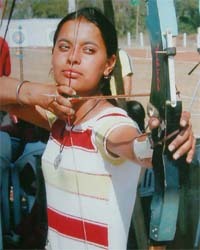 She feels that compound bow, worth Rs one lakh, would help in improving her game. She further hopes that she would soon get it from her college. Plays have its own place in Punjab’s literary culture and a stage artist lives thousands of lives during a single life span. In the last few decades, Punjabi stage has flourished and proved its excellence amongst other theatre traditions with the unending and selfless contribution of various artists who were instrumental in taking to Punjabi stage to other parts of the world. Among them is Har Rajeshwar Dyal Singh (also HRD Singh) from the Holy City. 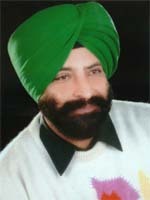 He belongs to the ninth generation of Bhai Nand Lal Sahib and has completed 25 years with Punjabi stage. He is also visible on TV and films. Since then, he has not looked back. He has worked under well-known directors and done about 100 plays and almost 5,000 shows. The famous amongst these are “Dhamak Nagare Di”, “Rishtiyan Da Ki Rakhiya Naa”, “Shaher Bimar Hai”, “Ek Tha Gadha”, “Hawa Mahal”, “Allana Teelo Teel”, “Anne Kane” and “Ek Aurat Farido”. 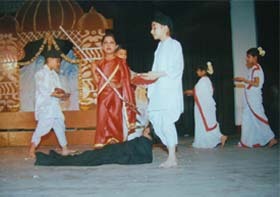 With the plays, he traveled across India and has even performed in Canada and America. HRD Singh is an approved artist of the Jalandhar Doordarshan and has worked in over 30 plays for this channel. These are “Lakeeran”, “Dabbi Agg”, “Akhara”, “Maharaja Ranjit Singh”, “Navi Musibat Aaye” (Alpha Punjabi), “Dal Dal”, “Sipahi Ki Diary” (Delhi Doordarshan) and others. He had also worked in various telefilms including “Dharam Di Chadar” and “Assin Doon Sawaye Hoye”. Presently, he is playing the role of a Sikh Jathedar in a Punjabi film, “Anokhe Shahid –Baba Deep Singh Ji”, besides enacting an important role in “Sardari” and the character of a sarpanch in “Ik Jind Ik Jaan”. HRD Singh has also lend his voice to the animation film, “Sahibzadey”. He was awarded the “Outstanding Young Person” award in the field of drama in 1987 by Jaycees Club; given the Punjabi Academy’s best actor award in 1987. The Punjab government has twice conferred upon him the “Nat Sharomini Award”. The artist has also made a religious telefilm, “Kes Guru Ki Mohar”. This film is now being screened in villages and cities through a projector. Among all genres of literary works, children’s literature demands utmost responsibility and painstaking efforts from its writer as it helps in shaping the formative years of a tender mind. The septuagenarian, Mr Avtar Singh Deepak, has dedicated his life to the literature for children. Though he writes in Punjabi, yet he is a recognised personality at national level for his contributions to the field. His works are based on themes that highlight the psychology of the country’s children. The idea of writing struck Mr Avtar Singh in the 1950’s when he began his career as a teacher. While teaching, he was frequently asked various questions regarding radio, television and other technologies by his pupils. Those inquisitive questions moved his mind and he, in an attempt to speak to large number of children, decided to write books on these subjects. Once a student told him that he would break open the radio set to see the singer in it. The kid’s remarks gave birth to the writer within Mr Avtar Singh, as it is after the incident he decided to write books for children. In his books, he follows the form of story telling. His works were acknowledged by the Central and the state governments from time to time. He penned six books in Punjabi for educating children about science and technology. Some of these were so impressive and helpful that the Punjab School Education Board introduced these as supplementary for Classes VI to VIII. Out of his six books, two were recognised at national level. They were “Tasveera Boldiyan” and “Ghar Ghar Bole Radio”. Both these books written in story form inform about the working of television and radio. He received four state level awards for his contributions. Apart from contributing books, he also wrote numerous essays, life sketches, grammar and edited a good number of books. He inherited flair for writing from his father Mr Bachan Singh, who worked with the first Punjabi newspapers which used to publish from Lahore. 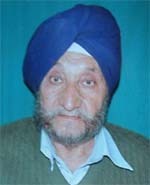 His wife Anwant Kaur had been editor of a monthly magazine ‘Kanwal’ and weekly ‘Jaltarang’. These observations were made by an eminent linguist, Dr Prem Singh from New Delhi, while delivering “Dr Diljit Singh Memorial Lecture” organised by the School of Punjabi Studies of the Guru Nanak Dev University here. Mrs Marginder Kaur, wife of late Dr Diljit Singh, was also present on the occasion. Speaking on the Indian traditions, as represented by famous grammarian, Panini, Dr Prem Singh explained in detail the origin, background and the basic structure of Panini’s important grammatical work “Ashatadhia”. Comparing the basis of Western linguistic traditions with Panini’s derivations, he concluded that the Western tradition was highly influenced by the Indian philosophers and scholars. To some extent, he added, many Western scholars could be considered as students of Sanskrit. Dr S.P. Singh, Vice-Chancellor, said Dr Diljit Singh was a committed Punjabi littérateur. He said the university had started a series of memorial lectures on Punjabi literature in memory of Dr Diljit Singh. Dr Manjitpal Kaur, Head of the School of Punjabi Studies, honoured Dr Prem Singh by presenting him a set of university publications. The Chairman of the Life Insurance Corporation (LIC), Mr A K Shukla, has said that the insurance company was planning to enter the Gulf countries for setting up overseas business centres to solicit petro dollars. Mr Shukla was in Amritsar recently to inaugurate the Divisional Office building “Jeevan Parkash” in the Civil Lines area. Talking to The Tribune, Mr Shukla said the corporation had achieved a record business target of Rs five lakh crore during the last 50 years. Elaborating on the last year’s growth pattern, he said the LIC had achieved 20 per cent growth, while this year the growth rate increased to 40 per cent, despite the private sector joining the competition. He said the growth of the private insurance companies had considerably declined from 147 per cent to 91 per cent during the current fiscal year. The statistics, he said, showed that the people had expressed tremendous faith in LIC. Mr Shukla said LIC’s share in the world premium market stands at 0.7 per cent and ranked 30th in the list of all the insurance companies in the world, while in Asia it is ranked fourth in overall performance. He said the total asset base of Rs 4.40 lakh crore made LIC the second largest asset-holder in the country only next to the Indian Railways. On the occasion of the golden jubilee celebrations, the corporation has announced a special bonus for all its policyholders. The LIC has nearly two crore policyholders in the country with face value of the policy insured amounting to Rs 10 lakh crore. He said LIC was going to set up training institutions as part of the orientation programmes for agents to be offered jobs in the life and non-life insurance companies. He said LIC would generate job opportunities by offering jobs to 3,000 educated youths by appointing them as development officers. Under the new employment programme, the corporation was going to recruit 500 to 1000 agents in the rural areas, he said. “More than 30 per cent business emanates from the public sector,” he added. “Moderate politics has replaced the political extremism in the present era. Hence, the political extremism has been relegated to periphery and moderate politics has started dominating the political scenario of the state”. The recent debates on terrorism in the Punjab Vidhan Sabha proved this point when the leaders of the Congress and the Akali Dal blamed each other for supporting terrorism. These remarks were made by Dr Kehar Singh, former chairman Punjab School Education Board, while delivering a keynote address during the inauguration of a two-day seminar on “Punjab Politics: Emerging Trends” at Khalsa College here. Sponsored by the Indian Council For Social Sciences Research (ICSSR), the seminar was organised by the Postgraduate Department of Political Science, Khalsa College here. The experts participating in the seminar expressed their deep concern over the new trends in the Punjab politics. The greed of power and corruption has deeply marred the development of the state, they add. Dr Prithipal Singh Kapur, former Pro-Vice Chancellor of Guru Nanak Dev University, addressing the seminar, said the present political trends should not be seen through narrow perspective but through the historical background. Meanwhile, the Department of Food Science and Technology of the college, in collaboration with Rotaract Club, organised a seminar on “Avenues in Food Processing Sector”. Dr Vanita Arora, consultant, Interventional Cardiologist and Cardiac Arrhythmia Services in the Department of Cardiology at the Escorts Heart Institute and Research Centre, has emerged as the first woman cardiologist to implant Implantable Cardioverter Defibrillator (ICD) along with Bio-ventricular pacemaker, a combo device, saving lives of many patients suffering from coronary heart disease. With the implantation of these devices, 20 to 30 per cent of the lives could be saved, she claims. Talking about her experiences, she said that a person suffering from coronary heart disease could suddenly loose consciousness and his condition can deteriorate to such a level where his blood pressure and pulse could not be recorded. She said such a patient was required to be given electric shock over his heart. She said this was caused due to ventricular fibrillation. She said the ventricular fibrillation was a very fast and the chaotic rhythm originating from lower chambers of the heart called ventriculars. She said these patients had to be treated promptly otherwise such a situation could lead to sudden death. Describing the process of defibrillation, she says that this technique brings back the normal rhythm by applying electric shock with a machine called defibrillator. Dr Arora treated more than 100 cases last year after being trained in the university hospital of Germany. She also learnt the management technique of complex Arrhythmias from Milwaukee, USA, where she earned her fellowship. The Health Department organised a workshop on prevention of vector (mosquito) borne diseases like malaria, dengue, kala azar, filaria and Japanese encephalitis, at its centre here on Tuesday. In the letter, the sarpanch, Mr Amrik Singh, alleged that the thieves even did not leave electric transformers, pipes, water taps, handles of the pump, electric motors, motor pipes, gas cylinders and even the poles installed by various government departments, including telecommunication department. Ironically, he alleged, even after the matter was brought to the notice of the police officials concerned of the Gharinda police station, nothing was done so far. He claimed that in some cases the accused were identified. However, the police let them off later without taking action against them, he alleged. Mr Sandeep Sharma, DSP (R), said he had not received any complaint in this regard. He, however, added that several cases of theft of electric transformers were registered with the Gharinda police station. He further said that if there was any complaint in this regard, the villagers should have approached him. He added that he would look into the matter. Ms Laxmi Kanta Chawla, state Vice-president of BJP, has urged the government and the General Manager, Northern Railways, to start an express train for Amritsar-Haridwar-Dehradun route. She said the railway authorities had decided to add new AC three-tier coaches with the current passenger train. She said the people were forced to travel by the only passenger train, which took 12 hours for completing the 415 km distance. Ms Chawla also urged the authorities to provide comfortable seats and food for the old age passengers. The blooming buds of Delhi Public School presented a heart throbbing performance of dance enactment showing the importance of river Ganga. Dr Inderjit Kaur, philanthropist and president of All India Pingalwara Charitable Society, was the chief guest. The performance of students, awesomely attired and embellished, sensitised the nerves of the audience who appreciated the performance. To give theoretical and practical training to learn about the traffic rules and regulations, a traffic camp was organised at Cuddling Heart School. The camp was organised by Mr Harjinder Singh, Traffic Education Officer. The children were informed about the automatic light signals, constable traffic signals and pedestrian crossing the road during the camp. Mrs Anwant Kaur, president Nari Chetna Manch, in a statement said the manch would honour Dr Kubir Singh Kang and Parminderjit, who were awarded by the Language Department, as Shiromani Sahitkar and Shiromani Kavi award. They would be honoured on February 25 in Bhai Nand Lal hall, Central Yateemkhana (orphanage) here. The work on developmental project, worth Rs 27 lakh, was inaugurated by the Improvement Trust Chairman, Mr Jugla Kishore Sharma, at Gate Kanhiya Market outside Sultanwind Gate. The project includes construction and repair of footpath at the cost of Rs 16 lakh and premix at Rs 11 lakh. The chairman said the demands of water cooler; toilets and deputation of sweepers would also be met.